E.coli is a member of the coliform group which is particularly associated with faecal matter and as such is a good indication of faecal contamination. Many people are confused about the significance of E.coli because of recent cases of food poisoning that have been caused by the species. Within species are smaller groups known as serotypes and these groups may have different characteristics. For example, serotype 1 may not cause food poisoning but serotype 2 might. With the recent outbreaks it is serotype 0157 that that has been responsible. 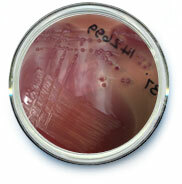 E.coli has been extensively studied over the years and a lot is known about the organism.